I have download a demo of CSS3Menu and created a basic menu as a test which plays O.K. by itself. I am building a new menu but for some reason, I notice a weird blur on the fonts in the menu. Is it possible to change the width of each menu button separately? I'd like the buttons to have the different width. I had hours of work into a menu and then after I saved it, I went in to try to find it, it was right there in the "Open Recent" file. 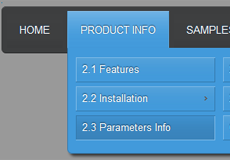 I've just purchased CSS3 menu 2.3 because I wanted to use the multicolumn template. I've been through all the templates, including the blocks templates and cannot find a multicolumn one anywhere. I am trying to make a purchase for a license for css drop down menu code on your website. Is there any ability to add scroll bar function to drop down menu?